In California, arson is considered a very serious felony crime. The Los Angeles criminal defense firm of Michael Kraut and the Kraut Law Group has unique experience litigating arson crimes. Mr. Kraut has been consulted to review arson crimes in Southern California including San Bernardino, Riverside and Orange County. All forms of arson are considered "strikes" and, therefore, will be used to enhance future sentences of anyone convicted of the crime. Arson is defined as the willful and malicious burning or charring of property. There are many types of arson crimes, including setting fire to one's property with fraudulent intent--such as to collect insurance money. Depending upon the type of arson committed, the punishment can vary significantly. Arson is investigated by elite and special units within law enforcement. They use the most advanced chemical analyses to locate the point of origin of a fire. Because of the significant loss of life and property that occurs as a result of arson crimes, law enforcement will sometimes take months or years to fully investigate before a case is charged. Law enforcement looks at the motivation behind this crime when conducting the investigation. In some cases, arson is committed as an act of retaliation for cooperation with the police, in domestic violence issues, to hide another crime including murder and for financial gain. In many instances, people will engage in arson to commit insurance fraud and get quick money. For those reasons, the resources that law enforcement put into fighting and prosecuting of arson crimes is enormous. 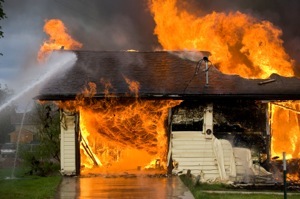 If you, or a loved one, is being investigated for an arson crime, or has already been charged with an arson crime, then you need to hire an experienced arson trial attorney who knows how to defend you from this charge. Penal Code Section 451(a) - Arson causing great bodily injury. This crime is a felony and is punishable with a prison sentence of up to 9 years. The prosecution must prove that you willfully and maliciously set fire and burned a structure, which caused great bodily injury to a person. Penal Code Section 451(b) - Arson of an inhabited structure. This crime is a felony and is punishable with a prison sentence of up to 8 years. The prosecution must prove that you willfully and maliciously set fire and burned an inhabited structure. Penal Code Sections 451(c) - Arson of a structure or forest. This crime is a felony and is punishable by a prison sentence of up to 6 years. The prosecution must prove that you willfully and maliciously set fire and burned a non-inhabited structure or a forest. Penal Code Section 451(d) - Arson of your own property or the property of another person. This crime is a felony and is punishable by a prison sentence of up to 3 years. The prosecution must prove that you willfully and maliciously set fire and burned the property belonging to yourself or another person. (He/She) acted willfully and maliciously. To set fire to or burn means to damage or destroy with fire either all or part of something, no matter how small the part. A person commits an act willfully when he or she does it willingly or on purpose. A person acts maliciously when they intentionally does a wrongful act or when they act with the unlawful intent to defraud, annoy or injure someone else. A structure is any building/bridge/tunnel/power plant/commercial or public tent). Forest land means brush-covered land, cut-over land, forest, grasslands or woods. Property means personal property or land other than forest land. If a person burns his own personal property and does so for any reason other then to defraud another person or a company, and no one else is injured, is not guilty of an arson. If you have been accused of an arson crime in Los Angeles, Riverside, San Bernardino, or Orange County, it is important that you seek the services of a criminal defense attorney with extensive experience with arson cases. If you have been arrested for arson in the Los Angeles or Southern California area, call Michael Kraut. Mr. Kraut understands the serious nature of this offense, how best to defend you, and how to resolve your case without you going to jail. Mr. Kraut has extensive knowledge of the law and the legal system. He has developed excellent relationships with law enforcement and law officials throughout the Los Angeles and Southern California. For more information about the various defenses for your arson case, and to schedule your free consultation, contact Michael Kraut at the Kraut Law Group. Mr. Kraut can be reached 24/7 at 888-334-6344 or 323-464-6453.